better known as Royal Interocean Lines. 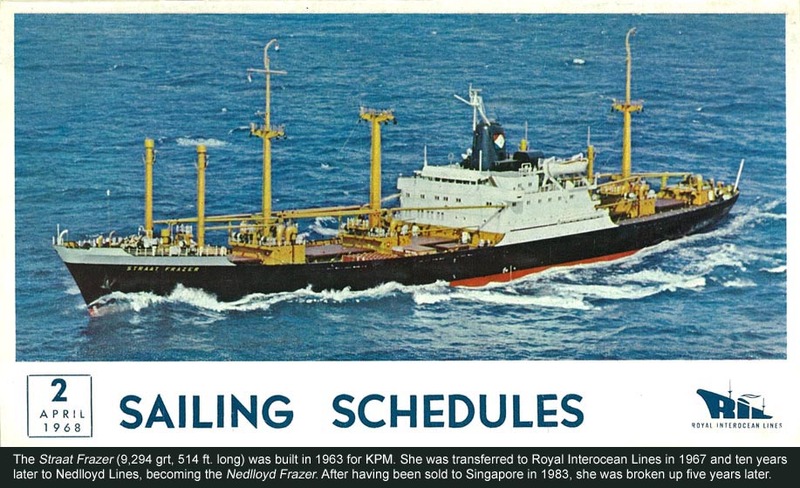 Many KPM ships were eventually transferred to the new company. 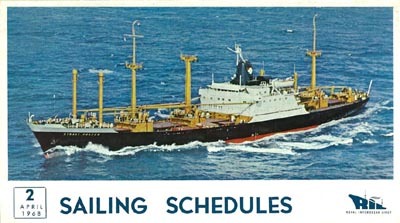 Royal Interocean Lines disappeared into Nedlloyd Lines in the 1970s. Tegelberg Yokohama, Nagoya (optional), Osaka (optional), Kobe, Hong Kong, Singapore, Port Swettenham and/or Penang, Mauritius, Lourenço Marques, Durban, Port Elizabeth, Cape Town, Rio de Janeiro, Santos, Buenos Aires. Return voyages: Buenos Aires, Montevideo, Santos, Rio de Janeiro, Cape Town, Port Elizabeth, East London, Durban, Mauritius, Belawan (one call each, otherwise optional), Singapore, Manila (Boissevain called once, otherwise optional), Hong Kong, Kobe, Osaka (optional), Nagoya (optional), Yokohama. Tjisadane Yokohama, Nagoya (optional), Osaka (optional), Kobe, Hong Kong, Singapore, Port Swettenham and/or Penang, Mauritius, Lourenço Marques (Tjitjalengka only), Durban, Port Elizabeth, Cape Town, Rio de Janeiro, Santos, Buenos Aires. Return voyages: Buenos Aires, Montevideo, Santos, Rio de Janeiro, Cape Town, Port Elizabeth, East London, Durban, Mauritius, Singapore, Hong Kong, Kobe, Osaka (optional), Nagoya (optional), Yokohama. (one homeward voyage as Straat Makassar before being renamed) Yokohama, Nagoya (optional), Osaka (optional), Kobe, Hong Kong, Singapore, Port Swettenham and/or Penang, Mauritius (optional), Lourenço Marques, Durban, East London, Port Elizabeth, Cape Town, Rio de Janeiro, Santos, Buenos Aires. Return voyages: Buenos Aires, Montevideo (optional), Santos, Rio de Janeiro (optional), Cape Town, Port Elizabeth, East London, Durban, Lourenço Marques (as Tjinegara only), Mauritius, Belawan, Penang and/or Port Swettenham, Singapore, Manila , Hong Kong, Kobe, Osaka (optional), Nagoya (optional), Yokohama. Tjiwangi Melbourne, Sydney, Brisbane, Yokkaichi, Nagoya, Tokyo. Return voyages via Yokohama, Osaka, Kobe and Hong Kong to Sydney and Melbourne. Tjipanas Shanghai, Hong Kong, Saigon (optional), Singapore (optional), Durban, Cape Town, Luanda, Matadi (optional), Douala (optional), Port Harcourt, Lagos, Apapa, Cotonou (optional), Lomé (optional), Tema, Takoradi, Abidjan, Monrovia, Freetown, Dakar. Return voyages: Dakar, Takoradi, Tema, Lagos, Apapa, Benin, Port Harcourt, Matadi (optional), Lobito (optional), Walvis Bay (optional), Cape Town, Durban, Lourenço Marques (most voyages), Singapore, Manila (optional), Hong Kong, Shanghai (optional), Japanese ports (probably Moji, Kobe and Yokohama). (last voyage Apr-Aug before scrapping) Yokohama, Nagoya, Kobe, Pusan (optional), Naha (optional), Hong Kong, Singapore, Port Swettenham, Penang, Mauritius, Lourenço Marques, Durban, East London, Port Elizabeth, Cape Town, Rio de Janeiro, Santos, Montevideo, Buenos Aires. Return voyage: Buenos Aires, Santos, Rio de Janeiro, Cape Town, Port Elizabeth, East London (optional), Durban, Mauritius, Singapore, Manila (optional), Hong Kong, Kobe. (last return voyage Apr-June before scrapping) Buenos Aires, Santos, Rio de Janeiro, Cape Town, Port Elizabeth, East London (optional), Durban, Mauritius, Singapore, Hong Kong, Kobe. Straat Banka Yokohama, Nagoya, Kobe, Pusan (optional), Naha (optional), Hong Kong, Singapore, Port Swettenham, Penang, Mauritius, Lourenço Marques, Durban, East London, Port Elizabeth, Cape Town, Rio de Janeiro, Santos, Rio Grande (optional),Montevideo, Buenos Aires. Return voyage: Buenos Aires, Santos, Rio de Janeiro, Salvador/Recife (optional), Cape Town, Port Elizabeth, East London (optional), Durban, Mauritius, Singapore, Manila (optional), Hong Kong, Kobe. Straat Hong Kong Kobe, Hong Kong, Singapore, Port Swettenham, Penang, Mauritius, Lourenço Marques, Durban, East London, Port Elizabeth, Cape Town, Rio de Janeiro, Santos, Rio Grande (optional), Montevideo, Buenos Aires. Return voyages: Buenos Aires, Santos, Rio de Janeiro, Salvador/Recife (optional), Cape Town, Port Elizabeth (optional), East London (optional), Durban, Mauritius (optional), Singapore, Manila (optional), Hong Kong, Kobe. Straat Fremantle Japan, Durban, Cape Town, Lagos (Apapa), Tema, Takoradi, Monrovia, Freetown. Return voyages: Freetown, Abidjan, Takoradi, Tema, Lagos (Apapa), Walvis Bay, Cape Town, Port Elizabeth, East London, Durban, Singapore, Hong Kong, Japan. Tjipondok Japan, Hong Kong, Singapore, Mahé (every other voyage), Mombasa, Tanga, Zanzibar, Dar-es-Salaam, Beira. Return voyages: Beira, Lourenço Marques (omitted on every third voyage), Mtwara, Dar-es-Salaam, Zanzibar, Tanga, Mombasa, Port Swettenham, Singapore, Manila (optional), Hong Kong, Japan. Hollands Dreef Shanghai, Hong Kong, Singapore, Durban, Cape Town, Luanda, Pointe Noire, Lagos (Apapa), Cotonou, Lomé (optional), Tema, Takoradi, Abidjan, Monrovia, Freetown, Conakry, Dakar. Return voyages: Dakar, Takoradi, Tema, Lagos (Apapa), Matadi (optional), Lobito (optional), Walvis Bay (optional), Cape Town, Durban, Lourenço Marques, Singapore, Manila (optional), Hong Kong, Shanghai (optional on certain voyages; omitted on other), Japan. Tjitarum Hsinkang, Hong Kong, Singapore, Mogadiscio, East Africa (Mombasa, Tanga, Zanzibar, Dar-es-Salaam, Mtwara). Return voyages: East Africa, Beira, Penang, Port Swettenham, Singapore, Hong Kong, Shanghai (optional), Hsinkang. Straat Luanda Durban, Lourenço Marques, Beira, Dar-es-Salaam, Tanga, Mombasa, Mauritius (optional), Auckland, Napier, Wellington, Lyttelton, Dunedin. Return voyages: Dunedin, Bluff (optional), ports within Sydney/Fremantle range, Durban. Straat Luzon Lagos, Tema, Takoradi, Abidjan, Cape Town, Durban, Lourenço Marques (optional), Melbourne, Hobart (optional), Sydney. Return voyages: Sydney, Auckland, Dunedin (optional), Melbourne, Adelaide, Fremantle, Durban, Port Elizabeth, Cape Town, Lagos. Straat Van Diemen Mombasa, Tanga, Dar-es-Salaam, Lourenço Marques, Durban, Cape Town, Fremantle (Chatham, Clement, Singapore only), Adelaide (Chatham, Clement, Singapore only), Melbourne, Sydney. Return voyages: Sydney, Brisbane (Cumberland, Johore, Van Diemen only), Hobart (optional), Melbourne, Adelaide, Fremantle, Mauritius, Durban, Lourenço Marques, Beira, Dar-es-Salaam, Tanga, Mombasa. Tjiwangi Melbourne, Sydney, Brisbane, Yokkaichi, Nagoya, Tokyo, Yokohama, Kobe. Return voyages: Kobe, Keelung, Hong Kong, Brisbane, Sydney, Melbourne. Straat Lombok Bombay, Cochin, Alleppey (optional), Colombo, Trincomalee, Penang, Port Swettenham, Singapore, Brisbane, Sydney, Melbourne. Return voyages: Sydney, Melbourne, Adelaide, Fremantle, Singapore, Malacca, Penang, Colombo, Bombay. 1) Singapore, Lautoka, Suva, Auckland, Wellington, Picton (optional), Lyttelton. Return voyages: Auckland, Cairns (optional), Manila, Hong Kong, Bangkok (optional), Port Swettenham, Singapore. 2) Singapore, Lautoka, Suva, Auckland, Wellington, Lyttelton, Dunedin. Sigli Bangkok, Songkhla (optional), Sibu, Kuching, Port Swettenham, Singapore, Brisbane (optional), Sydney, Melbourne. Return voyages: Melbourne, Devonport (optional), Sydney, Tawau (Van Neck and Van Noort only), Sandakan (Van Cloon and Sigli only), Kota Kinabalu, Labuan, Bangkok. Straat Cook Brisbane, Newcastle, Port Kembla, Melbourne, Durban, Cape Town (optional), Rio de Janeiro, Santos, Montevideo (optional), Buenos Aires. Return voyages: Buenos Aires, São Francisco do Sul, Santos (optional), Rio de Janeiro (optional), Cape Town (optional), Durban, Melbourne, Sydney, Brisbane. Van Riebeeck Durban, Lourenço Marques, Dar-es-Salaam, Zanzibar, Mombasa, Mukalla, Muscat, Dubai, Bahrain, Kuwait, Basrah, Korramshahr, Abadan. Return voyages: Abadan, Kuwait, Muscat (optional), Mukalla, Mombasa, Zanzibar, Dar-es-Salaam, Beira, Durban. Silindoeng Dar-es-Salaam, Zanzibar, Mombasa, Kuwait, Basrah, Korramshahr, Abadan. Return voyages: Abadan, Dar-es-Salaam, (Zanzibar, Mombasa). Click to view a cavalcade of sailing schedules from 1968 to 1971. 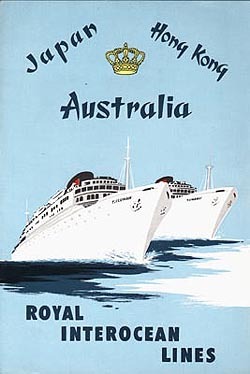 See the archives section for more brochures of Royal Interocean Lines.